A term that often pops up while reading about sustainable development, efficiency or growth is "circular economy". We should aim to shift towards a circular economy model to reduce our environmental footprint, optimize costs, produce efficiently... and so on. But what is the circular economy? Why should businesses, industries and people care? This post should serve as a short introduction to the concept. Essentially, the circular economy is the more sustainable alternative to our current "linear" economy system. What most industries do right now is: Take, Make and Dispose. Extract resources, process them into products, dispose off after use as waste. This is a linear system, the waste after use ultimately goes back to the earth and is, more often than not, toxic, unusable or takes long to biodegrade. Our economy runs on this linear chain of events. In the long run, this is definitely not a sustainable approach, since we can only "take" so much from a finite planet and "dispose" only so much in a finite area. Remember, when we think we're throwing things "away", there really is no away in the first place. One's waste is another's food. We need new patterns of production and new systems of thinking. In a circular economy model, we learn from the Earth's natural systems. Whatever nature produces, goes back to nature and this cycle indefinitely repeats (a very simple example would be, a plant grows from the soil, lives and uses water/resources, dies and decomposes back into soil providing nutrients for other plants). Somebody's waste is someone else's food. 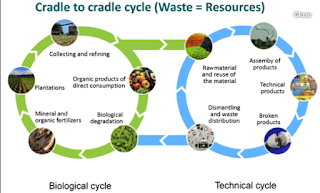 Similarly, circular economy takes inspiration from natural processes so as to design methods, products or business models that are similar to this regenerative process. 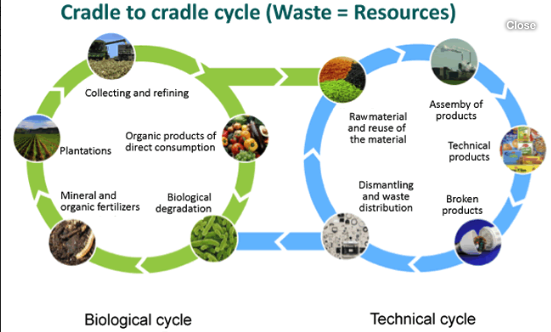 The circular economy model (though not very easy to achieve) is ultimately less wasteful, uses resources more efficiently, and more industries should adopt the process for long-term overall sustainable development.